For years, I have been told the story of how PCBs and other toxic chemicals cling to soil particles and tiny organic debris as polluted water washes off the land. Eventually, the PCB-laden particles are carried into Puget Sound, where they settle to the bottom. From there, they begin working their way into marine animals, disrupting their normal functions — such as growth, immune response and reproduction. The idea that contaminants settle to the bottom is the story I’ve been told for as long as I can remember, a story long accepted among the scientific community in Puget Sound and across the U.S. So I was surprised when I heard that leading scientists who study toxic chemicals in Puget Sound were questioning this long-held idea about how dangerous chemicals get into the food web. Puget Sound may be different from other waterways, they said. Jim is a longtime researcher for the Washington Department of Fish and Wildlife. I have worked with him through the years on various stories about the effects of contaminants on marine organisms. But now he was talking about changing the basic thinking about how chemicals are transferred through the food web. Jim postulates that many of these PCB-laden particles that wash down with stormwater never sink to the bottom of Puget Sound. Instead, they are taken up by tiny organisms floating in the water. The organisms, including bacteria and phytoplankton, are eaten by larger plankton and become incorporated into fish and other free-swimming creatures — the pelagic food web. Jim presented his findings at the Salish Sea Ecosystem Conference last month in Vancouver, B.C. Sandie O’Neill, another WDFW researcher, presented other new information about the transfer of contaminants through the food web — from plankton to herring to salmon to killer whales. My stories about the studies conducted by Jim and Sandie (with help from a team of skilled scientists) were published today in the Encyclopedia of Puget Sound, where you can read them. These are the first of at least 10 story packages to be to written by a team of reporters working for the Puget Sound Institute. The Salish Sea conference was attended by more than 1,100 people, including 450 researchers and policymakers who talked about new information related to the Salish Sea — which includes Puget Sound in Washington, the Strait of Georgia in British Columbia and the Strait of Juan de Fuca on the U.S./Canada border. When I first heard about Jim West’s idea regarding the fate of toxic chemicals circulating in Puget Sound, I thought one result might be to shift restoration dollars away from cleaning up sediments to cleaning up stormwater. After all, if the majority of PCBs aren’t getting into the sediments, why spend millions of dollars cleaning up the stuff on the bottom? Why not devote that money to cleaning up stormwater? 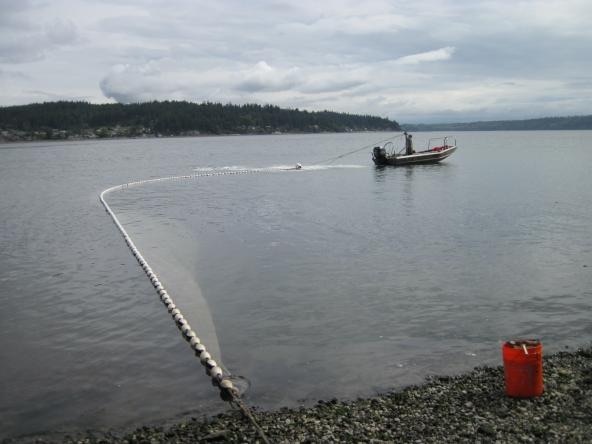 In fact, the worst of the contaminated sediments in Puget Sound have been cleaned up, with some cleanups now under way. That helps to ensure that toxic chemicals won’t get re-suspended in the water and taken up into the pelagic food web all over again. A few hotspots of contaminated sediments may still need some attention. As far as putting the focus on stormwater, that’s exactly what the Puget Sound Partnership has done with support from the Department of Ecology and other clean-water agencies. It is now well established that the key to reducing pollution in Puget Sound is to keep toxic chemicals out of stormwater or else create settling ponds, rain gardens, pervious pavement and other methods to capture the PCB-laden particles before they reach Puget Sound. I noticed that Ecology just today announced a new round of regulations to control stormwater in King, Pierce, Snohomish and Clark counties. Proposed changes include updating stormwater programs for new construction projects and for redevelopment. An appendix will describe Seattle’s plan to reduce stormwater pollution in the Lower Duwamish River, where PCBs are a major problem. For more on stormwater regulations, go to Ecology’s website. As Sandie told me during our discussions, all the work on fixing habitat in Puget Sound streams is not enough if we can’t control the discharge of PCB’s — which were banned in the 1970s — along with newer contaminants still working their way into our beloved waterway. Any measure of healthy habitat must include an understanding of the local chemistry.